And KRON 4 is reporting about Tahoe as I type. While the snow has stopped falling, chain control is still in effect on Route 80 in Truckee. And the reporter can see that Northstar's snow-guns are going full blast. Those guns are why Northstar had the most coverage of any Tahoe resort last season! First, Ask an Instructor Day is this Saturday, from 10am to 2pm at the Sports Basement in the Presidio. If you happen to be a member of the Golden Gate Mother's Club, you can attend an early session at 9:30. Anyone who signs up or stops by the Community Area to chat with us gets 10% off their purchases that day, even if the things you purchase have nothing to do with skiing or boarding. Event details are here on this Facebook page, which you can feel free to pass on to friends with nascent or potential young skiers or riders. The format is 15 minute talks on various topics along with a lot of personalized Q&A and shopping/sizing assistance from the instructor team. Unlike last year, I've invited David Overfield, a great snowboard instructor from the Burton Academy. Those of you whose kids are ready to break my heart and trade their skis for a board should meet David, as he's one of the academy's best children's instructors. Second, there's a special number for folks wanting to reserve lessons prior to opening day. It's (530) 562-3546. After we open, (530) 562-3848 will again be the private lesson reservation line. As some of you have already done, the easiest way to book a lesson is to call or email me, and I will work with the office to block off the time for you. The office staff only needs a quick confirmation call if your details are not up to date in their computer system. Hope to see you on Saturday at the Sports Basement, or very soon on the slopes in snowy Tahoe! PS. 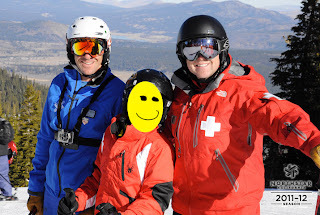 As always, I'm commenting here on my blog and on Facebook as a private citizen and crazy ski instructor. I'm not representing Northstar or Vail Resorts. This week, we've got a great blog post from Tom Sherry, a great instructor who also happens to be a ski patroller. Before you here all about keeping your family safe on the slopes, here's more about Tom from a recent bio. Tom has been teaching children and adults alike for almost 20 years. He started instructing tennis after playing on his division III college team. He's been a medical and sled instructor with the National Ski Patrol for almost a decade. He's been teaching skiing since 2008 and is certified professional. Before living the dream in the land of fruit and nuts, he attained his degree in Multimedia Technology and Business. He was a project manger for over a decade with various different start-ups and dot-coms. Tom and his wife Kathy live in the Sacramento Valley with their two children, Sierra (8) and Rourke (5). In the summer he is the Assistant Tennis Director for Millennium Sports Club in Vacaville, CA. As an active patroller for the last 11 seasons I've seen people's worst day of skiing. It says it on the back of all our tickets, skiing is inherently dangerous. Even with little skiers and riders the forces that come into play are serious. Believe it a or not a lot of these events could be avoided with some common sense and planning. When I'm teaching anything, Safety, Fun, and Learning are always in the back of my thoughts. Is the activity or skill, or game SAFE is always my first question. Some of the points that I've passed along to both my students and children are as follows. Don't break anyone's "magic bubble". This bubble extends from the tip and tail of your skis to the top of your head. If you never break a magic bubble you can't get hurt. Have a meeting place and time in case you get separated. The top or bottom of a lift is always a great place or near a "super sign". Teach your children that people in uniform with name tags can help. Move quickly at the top of lifts and don't linger at the bottoms because these areas are the most congested. You could also choose lifts that are less congested, even if they are slower chairs or don't access the best terrain. Bar up or Bar down? I've heard arguments made both ways. Vail resorts requires all employees to have the bar down at all times. Other ski schools I've worked for specifically stated that the bar was not to be down for ski school. Children will assume that if the bar is down there is NO way the can fall and creates a false sense of security. Whether you put the bar down or leave it up, have your children "Sit Back, Sit Still, and Look Ahead"! I hope you will find these tips as helpful as I have over the years and I wish you, your family, and friends safe snow sliding this and all seasons!